I was born in August and my mother opened a restaurant the next May. It had a great location, right on Highway #1 between Saint John (the biggest city in New Brunswick) and Calais, Maine (the 5th busiest border crossing between the US and Canada). She ran the restaurant for 29 years until she was 69 when she retired. The restaurant lay dormant for a few years until Dave Comeau convinced my mother that she should sell it to him. She did and Dave built the Comeau’s Seafood Restaurant into a thriving business specializing in fresh cooked seafood and home-made desserts. Rachael, Dave’s wife, does the baking and oversees the kitchen ensuring that each dish is of the highest quality. Dave and Rachael have changed the restaurant a great deal since I was a kid but the flavor of the food still reminds me of my Mom’s cooking. Donna and I went to the restaurant at lunch today for the Hot Hamburger that Donna was craving. For some reason, we have never been able to get a Hot Hamburger in the US since we moved down there. The dish is pretty simple, a large Hamburger Patty is placed on a slice of Plain White Bread, covered with Brown Gravy and then another slice of bread and more gravy. Donna’s dish came with Mashed Potatoes, Diced Carrots and Coleslaw. Somehow the combination of gravy, hamburger and white bread are different than a burger and it always brings me back to my Mom’s cooking. The home-made gravy has obviously been simmering for hours if not days as it was brown and rich and just full of flavor. The sweet carrots and creamy mashed potatoes were nice contrast in texture and savory flavors of the meat and gravy. We still wonder why Diners across the US have not picked up this simple dish but if you are Pennfield Ridge, New Brunswick area make sure you try the Hot Hamburger. I went for the Scallops and Haddock Platter as I knew the seafood would be fresh and it was Friday. The dish did not disappoint. With lightly battered fish and scallops, a generous portion of Fries and a side order of Coleslaw it was delicious and more than I could eat in one sitting. The light batter on the fish easily broke away to reveal flakes of Tender Fish that were sweet. A few drops of the tart lemon juice set up a great ying-yang of flavors. Same held true for the scallops but the flakes were replaced with a dense scallop meat that divided easily with the fork. The fries come breaded at Comeau’s so they were different than the other fries I have been eating this week and that was a welcome changed. Perfectly Cooked, as was the fish, the fries were crisp but maintaining a potato taste inside. The home-made Coleslaw was extra tangy today with crispy cabbage and a few carrot pieces mixed into what is becoming my favourite salad. It was a great dish and proved again that Comeau’s Seafood is some of the best around. Check it out if you are driving through my old homeland. Read other reviews about Comeau’s Seafood Restaurant here, here and here. I found the third entrant in our Lobster Roll Challenge while searching for the Internet. My home in Canada doesn’t have Internet access since we only use the home for a few weeks each year and rely on my older kid’s access or public Internet access. St. Andrews used to have an Internet Café but that went out of business when most of the bars in the area started to offer free WiFi service along with Moosehead and Molson’s. But it was early when I arrived in St. Andrews and the bars hadn’t opened yet (Nobody Panic – I have a back-up plan – LOL). As I sat watching the local Famers’ Market take place I fired up the computer to be ready when the bar I had targeted did open. The Find LAN button picked up 6 bars in walking distance that offered WiFi including the Kennedy Inn across the street from where I was sitting. Since the Inn was Inn it was open. The Inn became my Internet home for the next 2 hours and the next entrant into the Lobster Roll Challenge. The Kennedy Inn’s version of the Lobster Roll is served with Fries and Coleslaw. The Lobster Roll itself is served in a New England Hot Dog Bun jammed with Lobster Salad. The meat again is a combination of generous chunks of Tail and Claw Meat, Mayo and Celery. This version was significantly moister than the 2nd entrant and a little moister than the 1st entrant. The meat mixture was also colder than the first two. The early morning time and the meat temperature suggested to me that the mixture was made the night before and stored in the refrigerator. It was still very tasty but I think if the temp had warmed up it was increased the flavor. The Golden Fries was crispy and well done but 10 more seconds of cooking would have put them over the top into the overcooked category. The Coleslaw was crunchy, tangy and an expected side to the roll. Net-Net a good competitor and worthy of a sample if you get to St. Andrews. Our second contender in the Lobster Roll contest comes from The Gables in St. Andrews, New Brunswick. 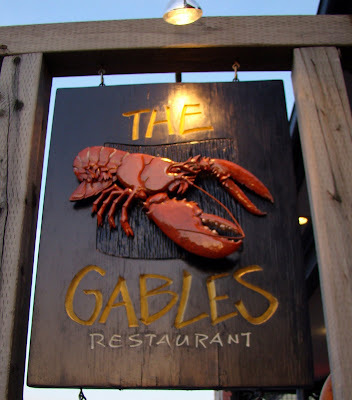 The Gables has a great outdoor patio right on St. Andrews Bay where you can eat in the sunlight and watch the tides flow in and out. I knew The Gables as the Black Bull when I was growing up and hanging around St. Andrews. They acknowledge their heritage a little bit by keeping the Bull Burger on the menu and it weren’t for the Lobster Roll challenge, that’s what I would have eaten. But back to the Lobster Roll. The Gables’ version of this classic seafood sandwich came with a few fries, a portion of coleslaw and a slice of lemon. The generous portion of lobster meat came in a Toasted New England Hot Dog Bun. The lobster was a combination of bite-sized chunks of body and claw meat. The meat was lightly tossed with some Celery, Parsley and a little Mayo. The mixture was seasoned with salt and pepper and topped with Paprika. I found the amount of mayo was very light compared to other Lobster Rolls I had tried before. I tried a few drops of Lemon Juice and that made the Roll a lot more interesting with the contrast of sweet lobster meat and tang from the lemon. The meat was moist enough to prevent the sandwich from being dry but a little bit more mayo would have help. It was a good sandwich in a great location. Read other reviews about The Gables here, here and here. We made it to Canada for the Labour Day Weekend and to be with our daughter for her operation. While the debate for health-care choices goes on in the USA we are going to see the Canadian system upfront after the weekend. I am sure it will work out but it gives me a great reason to visit Wendy, Steven and my Mom before returning to the USA. While we are here, we have to eat so I intend to share some of our Canuck food adventures. A few months back, I created a Sandwich Survey to find out what the readers felt was the best sandwich. I tried to include every kind of sandwich I knew which was an impossible task given there are so many to chose from. My Google and Facebook friend Mary Ann took me to task for not including a Lobster Roll in the choices. So here I am in the land of the Largest Lobster Pound in the World so I am going to try the Lobster Rolls at a few local establishments and report back here on the blog. My first Lobster Roll, Donna can’t do seafood or it will be ugly for everyone, to report on was at Fisherman’s Cover Cafe in Lord’s Cover, Deer Island. It was served on a simple toasted bun with Jumbo Chunks of lobster meat coated in Mayo and mixed with fresh Celery. Topped with some Red Paprika it was a simple but delicious and a classic summertime sandwich. I have had Lobster Rolls over the years but I was impressed with density of lobster meat, both from the body and claws, that made up the majority of the sandwich. The sweetness of the lobster and crunch of the celery and bun gave the sandwich nice contrasts in textures. It was a great Lobster Roll so let’s grade this first one as an “8” and measure the next few rolls against that score. In case in comes down to cost, and I hope it doesn’t this one was $12.95 CDN or about $10 USD. Chowhound CW and fellow bloggers Lynne Goldman and Rich Baringer over at Bucks County Taste reminded me that the Duck Deli BBQ in New Britain has the Best BBQ in Bucks County. They aren’t the only ones, the other reviewers below and readers of the local newspaper have voted the Duck Deli the Best BBQ in Montgomery and Buck Counties. I have to agree they have great Pulled Pork Sandwiches, BBQ Wings and BBQ Ribs. Donna and I visited the Duck Deli a few years back with the boys and had a great meal so when we drove thru New Britain last night I knew we should stop and get some take-out to confirm our impression. I got a Pulled Pork Sandwich, 2 orders of BBQ Wings and a rack of Baby Back Ribs. The Duck Deli positions itself as the best North Carolina BBQ in Bucks County and although has local ownership it keeps true to the North Carolina BBQ traditions. Knowing that, I had to try the North Carolina Pulled Pork Sandwich. I was reward with a delicious sandwich with the a generous portion of Carolina pulled pork made moist with their apple vinegar dressing. I had the Coleslaw on the side because it was a take-out order but I added the crunchy slaw to the sandwich before eating it thus giving it some crunch and some sweetness from the slaw dressing. The Duck Deli offers it’s BBQ Wings in orders of 5, 10 or 15 in either Buffalo, Honey or Western sauces. I got 5 of Buffalo and 5 of Western. These wings were a little different than the other hot wings reviewed here on the blog. These were BBQed over a wood fire as opposed to deep fried and you get the whole wing including the tip as opposed to just the two smaller sections. Both types of wings were fall off the bone tender and the different sauces either brought some heat or a sweet smokey flavour to the already mosit and tender chicken meat. The small slivers of Celery were crisp and perfect for dipping the creamy Blue Cheese Dressing. The dressing had nice chuncks of blue cheese making the mayo based sauce tangy. Very good BBQ wings. The special that night were Baby Back Ribs with a choice of sauces. I went for the Western Sauce which the waitress said was a tomato brown sugar sauce. I ordered a full rack to go and they were the best ribs I have had since I left South Carolina. These ribs had obviously been slow cooked on a wood-fire pit for a long time. Each rib had the remnance of slightly spicy dry rub. The almost fall-off-the-bone ribs still maintained some density making each bite a good chew as opposed to just falling apart. The western sauce brought some tang to the ribs contrasting nicely to the sweet moist pork flesh. One rack was not enough as the boys quickly smelled the aroma of the BBQ as we tried to secretly (LOL) unpack the take-out meals and the decented like locusts and ate up the ribs. We will have to go back soon and we hope to see you there. I have added Duck Deli to the Best of Bucks Co – Top 5 BBQ. To see the orther making the list check it out here. You should also know that the Duck Deli is offering All-You-Can-Eat BBQ on Monday nights for $17.95 for adults and half price for children. Check it out and let us know what you think in the comment section below. Read other reviews about the Duck Deli here, here and here. I had lunch with Digital Marketing Guru Amy today at Bowman’s Tavern just south of New Hope. I have been a client with Amy when she was at three different major agencies and she is a leader in the multi-channel space. It was a great lunch and she gave some great advice about my current projects. While we talked we enjoyed a very nice meal and great service from the hostess and waitress. For starters, Amy had a cold Yellow Tomato Gazpacho soup and I had their French Onion soup. It was a perfect day for a cold soup as it was actually hot and didn’t rain until late afternoon. The waitress chased down the chef for us and let us know the soup contained Yellow Tomatoes, Cucumber, Cilantro, Garlic, Yellow Pepper, Onion, Orange Juice and Seasonings. The overflowing bowl of soup was dominated by the Strong Orange Flavour. The soup had pieces of diced Yellow Tomato, Yellow Pepper and Cucumbers to give some texture to the pureed soup. Amy liked her soup and wondered why she did make this at home more often. I went for the French Onion Soup despite the heat because I heard it was very good. When it came I found that the Sweet Broth, from the caramelized onions, chicken stock and some white wine, dominated the soup. I have had way too many French Onion Soups that were way too salt because broth was made from bullion cubes but this broth was perfectly seasoned and sweet to the taste. The Croutons and blend of Melted Cheeses added texture to dish. The combination of sweet broth, croutons and melted stringy cheese made this a very good French Onion Soup. Amy went for the last Daily Special Lamb Chop Salad. This colourful salad came with three Double Cut Lamb Chops and a variety of veggies. In addition to the crisp salad greens the dish came with Tomato wedges, slightly caramelized Onions, Yellow Peppers and Feta Cheese in a Balsamic Vinaigrette. The crisp veggie textures contrasted nicely with medium rare Lamb Chops and the creamy Feta Cheese. The meaty chops contrasted well with the slightly salty Feta and the sweetness of the Balsamic dressing. A great salad and I could see why Amy got the last one that day. Perhaps when you go, they will have one ready for you. I went for the Classic Reuben Sandwich for my main. The individual components of the sandwich blended into one great taste sensation. The tender lean Corned Beef, the crunchy tangy Sauerkraut, sweet slightly melted Swiss Cheese and tangy Russian Dressing, served on toasted Rye Bread was potentially the best Reuben I have ever had. The crispy fries and pickles were a bonus for the dish. Great sandwich. Amy and I both liked our salad and sandwich at Bowman’s, but we want to know what your favourites are. So take the Food Surveys and tell us your Favourite Salad and Favourite Sandwich are. Read other reviews about Bowman’s Tavern here, here and here. Kevin Nalty or “Nalts” is a legitimate “Web Celebrity” with over 800 YouTube videos that have been viewed over 75 million times. Kevin is very funny and you can check out some of Kevin’s videos here and here. Kevin is also a friend of mine and we had lunch today at Bobby Simone’s in Doylestown. It was a beautiful day so we ate outside in their patio area. It was very pleasant and the services was great. Kevin ordered the Iberian Burger and I ordered the Roast Beef Sandwich. Kevin got the Iberian Burger. It was a 6 ounce burger on Ciabatta Breadwith thinly sliced ham with cheese and avocado slices. The Iberian moniker comes from the thinly sliced Serrano Ham, which is very like prochuttio. The burger came with a hefty order of hand-cut Idaho French Fries. The moisture of the Melted Cheese and Avocado matched well with slightly dry ham. I liked the bits of peeling left on the fries giving them some texture. I also like my fries to be stiffer these were a little limp for me. They were well cooked and flavourful but a little stiffer would have made them perfect.It was a very good burger and gets an honourable mention on the blog’s Best of Bucks Co – Burger Top 5 List. I ordered Roast Beef Sandwich in fact the menu described it as The Best Roast Beef Sandwich in Bucks County. The sandwich comes with Swiss Cheese, Horseradish, Demi Au Jus on a Brioche Bun with Hand Cut Fries. It was a great sandwich with my only problem being that they over grilled the bottom bun too much leaving it too charred. The key ingridents, the thinnly sliced Beef and Swiss Cheese were moist and flavourful. Strong beef flavour and tender to the bite. This version of a French Dip sandwich came with a great Demi Au Jus– great beefy taste, warm and not salty as many Au Jus end up being. The Horseradish Sauce was nice and creamy with enough heat to let you know it was horseradish. I described the fries already but they went well with the sandwich. It was a great beef sandwich, the best I have had in Bucks County. Perhaps I should start a Best of Bucks County list on Roast Beef sandwiches. Read other reviews about Bobby’s here and here. We have been in the US since 2001 and have celebrated eight Canada Days down here. Over the years we have celebrated by having BBQ’s, Poker Tournaments, Dinners out and Friend in but this year is going to be quiet. I have a big presentation tomorrow so we are keeping it quiet. We will make it up on the Weekend but for now I am going to write about the foods we miss back in Canada and try to have each time we go back. Donna and I compared list and had a few common items. Hot Hamburger Sandwiches, Donairs, Poutine, Chow-chow, Dulse, Crispers and Caramilk chocolate bars . My Canadian friends will know what these are but for my American friends, I’ll provide some details on what the items are. A Hot Hamburger Sandwich is a lot like a hot roast beef sandwich except a large hamburger patty replaces the roast beef. Beef gravy goes on the patty, bread covers the patty and more gravy on the bread. Fries or mashed potatoes and vegetables comes with it. Sounds simple but we haven’t seen on down here yet. A Donair is a spiced meat in a pita wrap sandwich with onions, lettuce, tomatoes and sweet donair sauce. It’s a lot like a gyro but the garlic sauce is sweet rather than savory. I have posted about these in my post on Middle Eastern sandwiches. Poutine is basically french fries, grated cheese and gravy. Again simple but haven’t seen it in the US. If you go to Quebec that have restaurants that serve 20 different combo of poutine including putting foie gras on it. We do make our own for Ryan and Robbie from time to time but not as good as a serving at 2:00 in the morning on say St. Catherine Street in Montreal. Chow-chow in Canada is simply pickled green tomatoes and yellow onions. US recipes have all kinds of other vegetables added but even though recipes show up on several recipe sites but no Chow-chow is seen on the stores shelves near us. Dulse is dried seaweed that has a strong salty taste with a crunchy texture at first that ends up being chewy. You get a big bag and eat it like potato chips – salty and crunchy. The best dulse comes from Dark Harbour in Grand Manan. Crispers are a Nabisco salty snack that are part chip – part cracker. Robbie loves these and we bring back bags of different flavours, Salt & Vinegar, BBQ, Ranch and Regular. Caramilk Bars are chocolate bar made by Cadbury that has pockets of caramel inside a wrapping of chocolate. Donna craved these when she was pregnant with Robbie so much we had a constant supply in the frig for the entire pregnancy. We miss these foods but vacation time is coming soon so we re-stock. If you are reading this in Canada, send us a care package if you can. LOL Happy Canada Day! Update – Ryan added some restaurants we miss back in Canada. Swiss Chalet – Rotisseary Chicken, Tim Horton’s – Coffee & Donuts, Deluxe French Fries – Fish & Chips, Osaka Japanese Grill – Beef Teriyaki, Vitos – Pizza and QB’s-Best Wings in the world. Hoagiefest is convenience store Wawa’s celebration of the hoagie sandwich. A hoagie, for my friends back in Canada, is a submarine sandwich. This year’s celebration runs from June 1 until July 26. Donna and I went there today for lunch. Wawa is the beloved convenience store here in Pennsylvania, New Jersey, Delaware, Maryland and Virginia with 570 different locations. The chain was started in 1964 and to celebrate their 45th Anniversary, they brought back their very successful 2008 Hoagiefest marketing campaign. The campaign features Mr. Kotter Doppelganger, the John Lennon-like Hoagie Man based in a Yellow Submarine-like environment promoting Four Different Shorti-sized hoagie sandwiches. The Yellow Submarine images make sense a chain started in the 60’s selling hoagies (subs) but the marketing team have gone all out with a themed microsite that features 6 Beatles-inspired hoagie related songs, Hoagiefest merchandise and a contest for submitting your own Hoagiefest song or video to go along with any of the 6 previously created songs. As a marketer, I really appreciated the integration of Wawa’s campaign which included a major TV advertising buy, online advertising, a viral contest and great in-store themed point of purchase advertising materials like the themed touch screen ordering devices that I used to purchase today’s hoagies. Four stores, one in each state, will have live Hoagiefest events including a 1/4 Mile Long Hoagie, Kara-hoagie sing-a-long contests and of course a hoagie eating relay race. Lots of give aways and free food. Unfortunately the live events won’t happen at our store in New Hope but still good event marketing integrated into a great integrated campaign. Hoagiefest features a different Shorti (6 inch) hoagie every 15 days. The sandwiches, in sequence, are Italian, Cheesesteak, Turkey & Meatball and each are just $2.99 during their 15 days of Hoagiefest. Donna decided to go for the Turkey Hoagie. Her hoagie came with turkey, provolone, tomatoes, lettuce, mayo, mustard, salt, pepper and oregano. The 6 inch hoagie was the perfect size for lunch and along with some potato chips and diet lemonade iced tea was a perfect lunch time filler. The hoagie was very good, the crunch of the fresh lettuce contrasted with dense soft bun, cheese and meats. The mayo and mustard combined into a nice sauce in the sandwich, coating the meats with a tangy sweet flavour. I went for the featured Cheesesteak Shorti. I had the option of several cheeses but went for the Provolone (no Cheese Whiz). I also added grilled onions some salt, pepper and oregano. Wawa gives you plenty of options on your hoagie but I went with a classic cheesesteak combo. Again the 6 inch sandwich, along with chips and lemonade ice tea, was perfect for lunch. The first bite had the taste of Grilled Onions coming strongly thru. The were sweet tasting and had a slightly smokey flavour. The second taste brought the Meat and Provolone to the forefront. The meat was mild in terms of spice but combined with the cheese a classic cheesesteak taste that I have come to love here in PA. A very good sandwich and a great value for $2.99. Net-net good sandwichs and a great marketing promotion. Read other reviews about Hoagiefest here, here and here. Let us know your Favourite Sandwich at the blog’s sandwich poll. What makes a great burger? Six to eight ounces of well cooked and seasoned Beef. Great fresh fix’ems like Lettuce, Tomato and Onions. A pickle is some fashion, sweet or sour but a Pickle. A choice of Cheeses and other add-on’s like sauteed or Fried Onions, avocado slices, bacon, roasted or fried peppers or salsas to make the burger different and interesting. A Fresh Baked Bun that controls all the goodies on the burger and soaks up the juices. And despite a great bun you need Three Napkins to clean up the juices from the burger. Not only is it about the freshest ingredients, it’s about serving the burger with some style and in an atmosphere that says Eat Burgers Here. That’s a great burger. So thanks to the recommendations from Facebook Friends and Chowhounds, I have managed to create my Top 5 Best of Bucks Co – Burger list. Donna and I personally ate at the locations and can easily recommend them to you. They’re worth the drive and the money you will invest. Enjoy. Despite completing the list we are still on the hunt for great burgers here in Bucks Co, so please use the Reply Box or Comment link at the bottom of this post to make suggestions or comment on your experiences with these choices. I am looking forward to your comments.